What do you see when you look at this Google Analytics summary? Looks like business is spiraling into oblivion, right? Everything is down, fire this digital marketing agency immediately! All of a sudden business benchmarks are looking pretty darn good, aren’t they?! Today you’ll learn how to analyze data beyond standard Google Analytics metrics and start understanding the real story behind your website’s wins and losses. One way to peer into this information is through the User Explorer feature within Google Analytics. 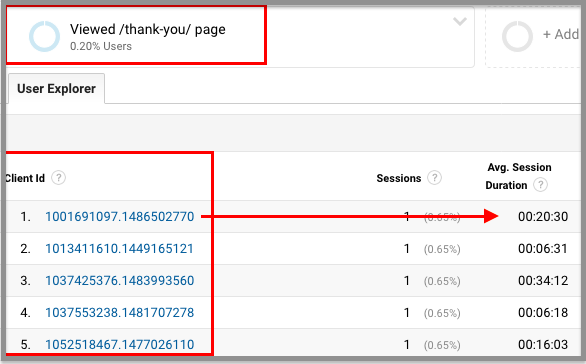 When visitors come to your website Google Analytics places a cookie that assigns a unique Client ID to that person. It also marks that person’s visit with a timestamp. Looks like this, Client ID: 12345678911.86738999. The first part, 12345678911 is unique random number and 86738999 is the a time stamp. Each time that particular user comes back to the website (typically within a 30-day window) their visit will be time stamped and recorded. This means you can use this data to view the specific days, times, pages visited, and actions taken over the course of a users’ journey —even over the course of multiple visits and many days. How do I use User Explorer? The User Explorer feature is capable of storing hundreds of thousands of unique Client IDs. Instead of trying to click through all of them set a custom segment to only view a particular action you want to review. For this example, we’ll look only at visits that ended in a conversion via a form completion. 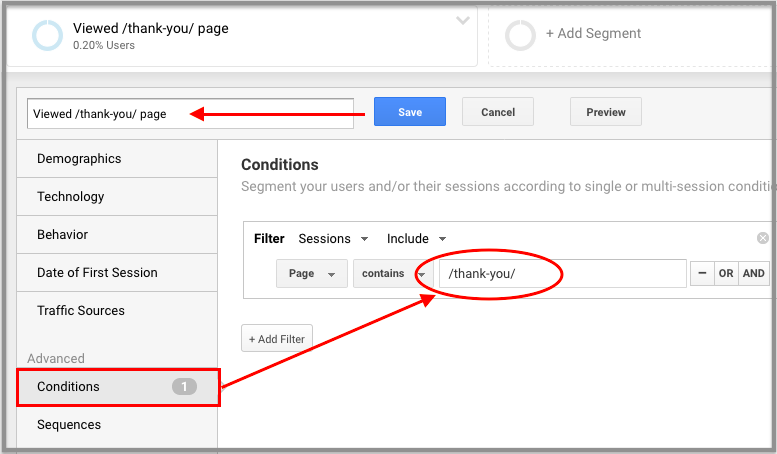 Create a custom segment to view a primary conversion, such as a Thank You page. Then, open the User Explorer feature to review the multi-visit behaviors of each converter. Once you access the Client ID list, double check that you’re only view the custom segment you set in step 1. Remove the default segment for All Traffic. Then see if there are any metrics that stand out. Number of sessions, time on page, revenue, transactions? Here is where you’ll see all the steps this visitor took while on your site. 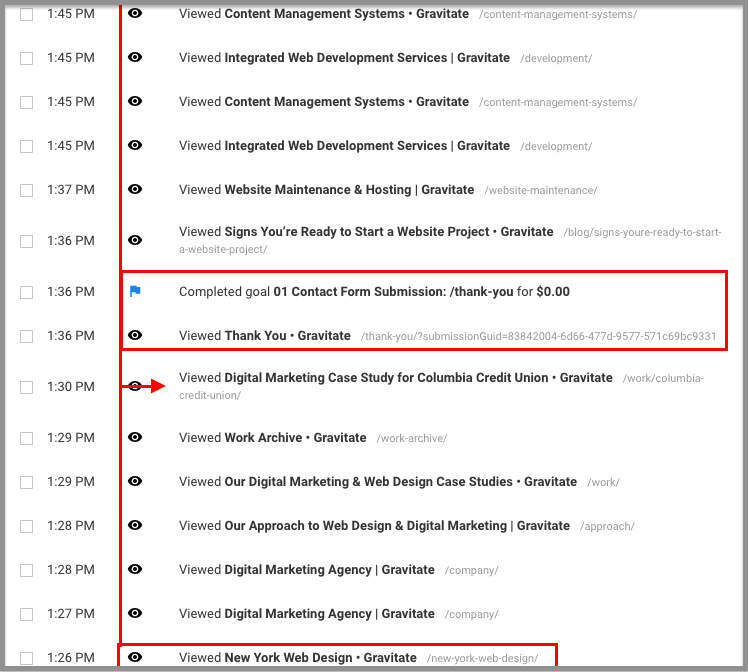 In the image below we see that they first hit our website at 1:26pm from an organic search which brought them to our New York landing page. They continued viewing a few other pages until completing the contact form at 1:36pm after reading one of our case study pages. After they submitted the form they continued reading additional pages to learn more. They’re obviously interested in having a custom CMS developed for them. This is great ammunition for learning what services our clients are interested in, and what pages on our website help (or don’t help) them find it. Next to each page view there is an icon that helps identify what type of action the user took on that page. These help quickly identify PageViews vs. mobile app views vs. Goal Completions vs. E-commerce vs. Events. We usually like to see what’s happening right before and after a Goal or Event. Order preference: If you open the drop down options under ‘Sort by’ and switch it from ‘Descending’ to ‘Ascending’ you can follow the user journey from top to bottom. Rather than bottom to top which is the default setting. 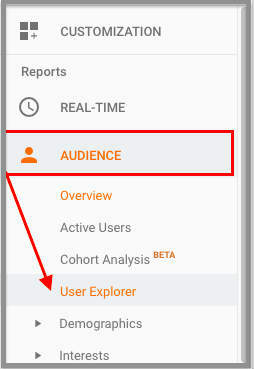 The User Explorer option a great first step in finding more meaningful data than merely relying on the Analytics’ overview summary. Especially if you don’t have heatmap tracking or custom Events set up to help you track user behavior. © 2017 ozaruworks.com. All Rights Reserved.